An underwriting agreement is a statutory necessity for Companies who have decided to increase their share capital by the issue of equity share. It is mandatory for the Company to file this agreement with the prospectus of public issue of shares/debentures with the Registrar of Companies. 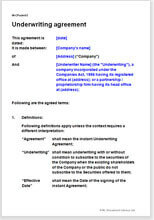 This is an agreement between the Company and the underwriter, whereby the Company agrees to allot the number of shares to the underwriter, as agreed to be underwritten by him and the underwriter undertakes to subscribe to the securities of the Company when the existing shareholders of the Company or the public do not subscribe to the Securities offered to them. A Share broker, merchant banker / underwriting firm in an arrangement for subscription to the public issue of a Public Limited Company. Protects the interests of both the parties. Other provisions to protect your interests.